Guns N’ Roses Film Vegas ‘Appetite for Democracy’ Residency Show in 3D - Rock Fuel Media Inc. Guns N’ Roses are gearing up to close out their 12-show ‘Appetite for Democracy’ residency at the Hard Rock Hotel in Las Vegas this weekend (Nov. 24.) For fans that weren’t able to make it out to one of the special shows, there may still be a way to check it out in the near future, thanks to modern technology. According to a tweet from the band, the concert on Wednesday, Nov. 21 was recorded as part of a special 3D taping, presumably for a future release. 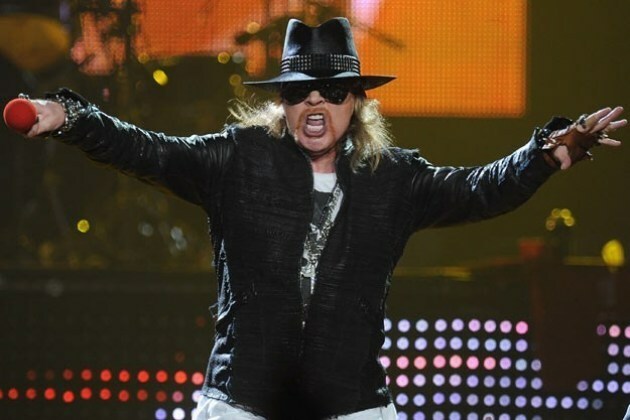 Known for their lengthy shows, Guns N’ Roses did not disappoint on this particular night. The set list was a monstrous, 30-plus song rock-a-thon featuring all the usual suspects from ‘Welcome to the Jungle,’ ‘Mr. Brownstone,’ and ‘Sweet Child O’Mine’ to covers like Pink Floyd’s ‘Another Brick in the Wall (Part 2)’ and Neil Young’s ‘Don’t Let It Bring You Down.’ A fan posted detailed listing of the set list and all the solos can be seen here. Guns N’ Roses are the second rock band to take up residency at the Hard Rock Hotel, following in the footsteps of Motley Crue who broke ground on the concept last February. Def Leppard also recently announced that they’ll be the next band to move into the Strip with a run in 2013.